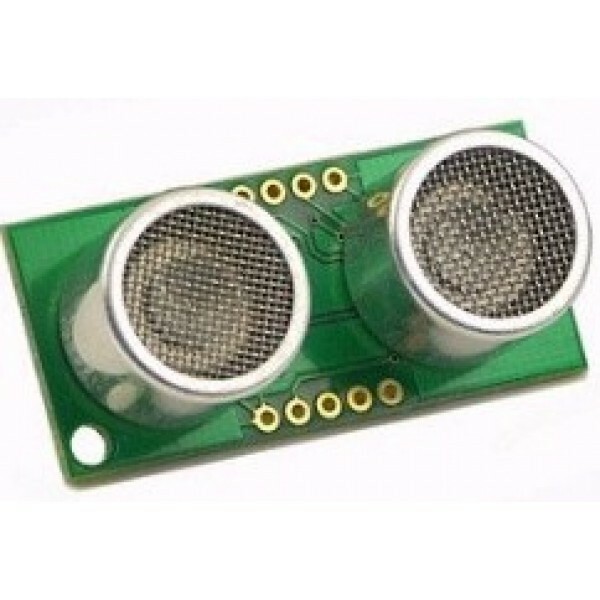 Ultrasonic module can be used to identify obstructions, 1 cm -4 meters. Can be easily connected to the micro-controller, such as BASICX. The latest model SRF05. Detection range of 3 cm from the original SRF04 -3 m, increased to 1 cm -4 meters. RF04 is compatible with the original. Also has smaller side lobes. The ultrasound module would be applied to the robot module. Your robot will be able to detect surroundings with bat-like sonar, requiring only a small piece of code. With accurate distance control your of the motor, your robot can easily avoid obstacles. Working voltage - 5v . Operating Current - 30mA Typical. 50mA maximum. Maximum detection range - 4 m.
Minimum detection range - 1 cm. Sensitivity - Detect 3cm diameter broom handle at> 2 m.
Input Trigger - 10uS Min. TTL level pulse. Size - 43mm x 20mm x 17mm high.